Trick of the Light theatre company puts the play back in theatre. Using minimal staging, made up of maps and cardboard boxes, it's an homage to child-like imagination. The three actors combine music, puppetry and shadow theatre to tell their dark fairytale. A young girl is sent out to earn a living for her family but strays from the allocated path onto a 'paper' road – a pretty standard fairytale, where adventure and danger follow accordingly. But by manipulating the normally linear structure, deeper themes surface. The little girl is first seen as an older woman exhibiting early signs of dementia. The story questions the importance of reality, and values the beliefs and dreams of the individual. Then there's the message of a paper road: anything which has energy and feeling invested in it does exist in some form. Switching seamlessly between puppets to represent the past (fiction) and themselves to depict the present (reality), the actors tell this heartwarming tale with the precision and care it deserves. As the audience leaves, the troupe are already dismantling their set. And this final melancholic touch, in seeing the puppets hanging, immobile on their stand, is a perfect finale. Assembly Roxy, until 27 Aug, 2.35pm, £10 (£8). This is a story about a girl, who followed a map off the edge of the world. 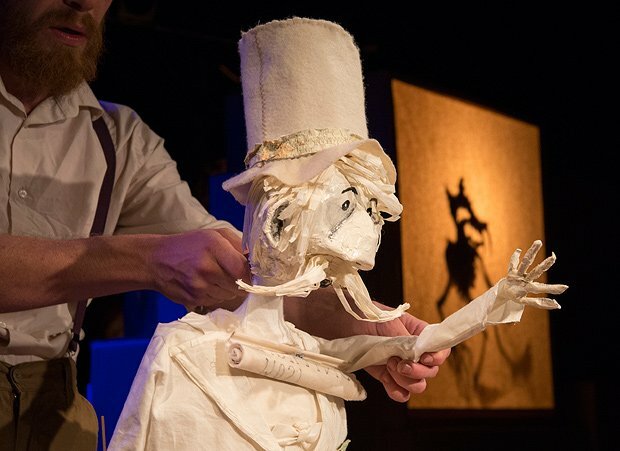 Trick of the Light Theatre (The Bookbinder) present an award-winning dark fairytale combining puppetry, shadow-play, and live music.